Cincinnati Bearcats guard Troy Caupain (10) dribbles the ball in the first half against the Middle Tennessee Blue Raiders at FifthThird Arena. 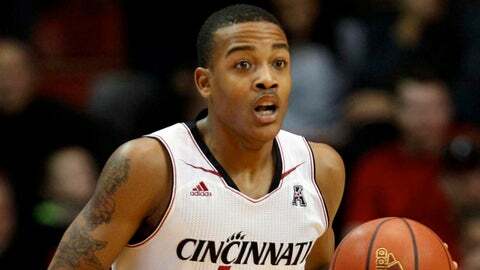 CINCINNATI (AP) — Sean Kilpatrick tied his season-high with 23 points as Cincinnati shook off a sluggish first half to roll to a 69-48 win over Middle Tennessee on Saturday. Justin Jackson recorded his third career double-double, all this season, with 16 points and 12 rebounds — tying his career-high — to help Cincinnati (9-2) win its second straight game after losing two in a row. Jackson also had four blocked shots, one shy of his season-high, before a crowd of 5,424, the second-lowest of the season at 13,176-seat Fifth Third Arena. Kilpatrick scored 16 points in the second half to move past Louis Banks and into eighth place on Cincinnati’s career scoring list. Kerry Hammonds finished with a season-high five 3-pointers and scored 17 points to lead the Blue Raiders (8-4), who shot a season-worst .267 (12-for-45) from the field while scoring their fewest points of the season. Middle Tennessee’s previous season-low in points was 59 in a 20-point loss at Florida on Nov. 21. Kilpatrick made a 3-pointer from the right wing with 18:23 left in the game, sparking a 10-2 Cincinnati run to open the second half. He capped the spurt with a runner, giving the Bearcats a 31-23 lead. Hammonds sank his third 3-pointer of the half with 25 seconds left in the first half to tie the score, 21-21. Hammonds, who hadn’t scored more than 11 in any of his three previous games and managed just two in the Blue Raiders’ loss 72-63 loss at Mississippi on Dec. 14, had 11 by halftime on Saturday. The first half was the fourth straight in which Cincinnati has failed to score 25 or more points. Three Bearcat starters failed to score in the first half. The game was the first of four straight at home for the Bearcats, who are scheduled to play Chicago State on Monday. The Blue Raiders are off until Dec. 29, when they are scheduled to play Maine in the Dr. Pepper Classic in Chattanooga, Tenn.